Good evening friends! Hoping this finds you all doing well and enjoying your evening!! This cheese making thing, is getting a little out of control. First hubs and I made mozzarella cheese, we have made it several times. He has been on me about making ricotta cheese forever. He LOVES ricotta cheese. Not my favorite, but I get that he enjoys it.... immensely. I wish I had 1.00 for every single time I put him off about this. I used every excuse in the book, from "it will be to hard" to "why can't we just buy it in the store" to "NO, I am NOT making ricotta". Well finally he was done taking no for an answer. I mean, he is a HUSBAND, shouldn't he be able to take NO for an answer? :) Anyway, I gave in. We looked up all kinds of recipes and techniques. I can't believe the variance from super easy recipes to super involved recipes. We ended up going with a recipe from epicurious.com for our first ever ricotta cheese making adventure. It was easy, took no special equipment, other than needing to pick up some cheesecloth we were ready to go. I will tell you in advance, this cheese was SO incredibly delicious, I will likely never buy it in the store again. Not only was it delicious, but I knew exactly all 4 things that went in it! How can you argue with that?!? In a large pot, add in milk, cream, and salt. Bring slowly to a rolling boil. This might take a bit! Be patient. When it is at a rolling boil, add in the lemon juice and turn off the burner. Let it sit for approx. 2-3 minutes. You will see it curdling immediately. When you think it is curdled as it should be, pour into cheese cloth lined colander and let drain. The longer you let it sit and drain the dryer your ricotta will be. This yields 1 qt of ricotta. (at least it did for us). Refrigerate at least 4-6 hours. Let it cool completely and then use however you choose. Use it savory, use it sweet, the options are endless. This is the best thing goin' and I can't WAIT to make it again and again! Funny how things change, eh? 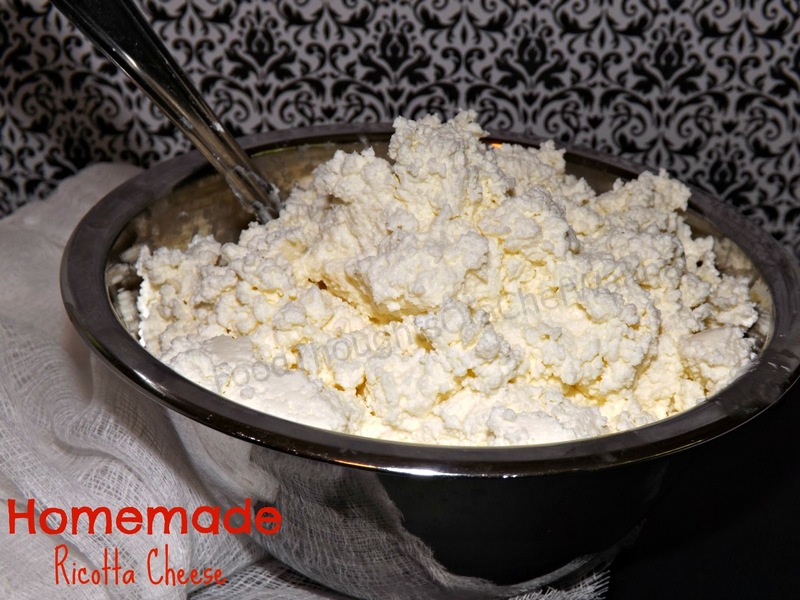 The recipes that I use ricotta cheese in only require about 1 - 2 cups. Is it possible to freeze the extra for later use? Hello Kristy! I would not recommend freezing. I haven't tried it but I don't anticipate that it would do well when thawed. Maybe plan a couple of ricotta dishes the week you make it. I have a great ricotta cookie recipe, they are fantastic!! Thanks for reading and if you should find out differently, that it WILL freeze, let me know! Thanks for reading! Awesome!! Gonna make this! I'm doing low carb/no wheat so I'm thinking this would be great with spinach! I'm the Mom of a soldier too! Hooah! I passed this recipe to my son, Clayton,who makes the absolute BEST in the world Lasagna! We are going to try making this too! Thanks! Ricotta has replaced cottage cheese in my lasagna, now I can make my own. Whoooooooohooooooooo!! !